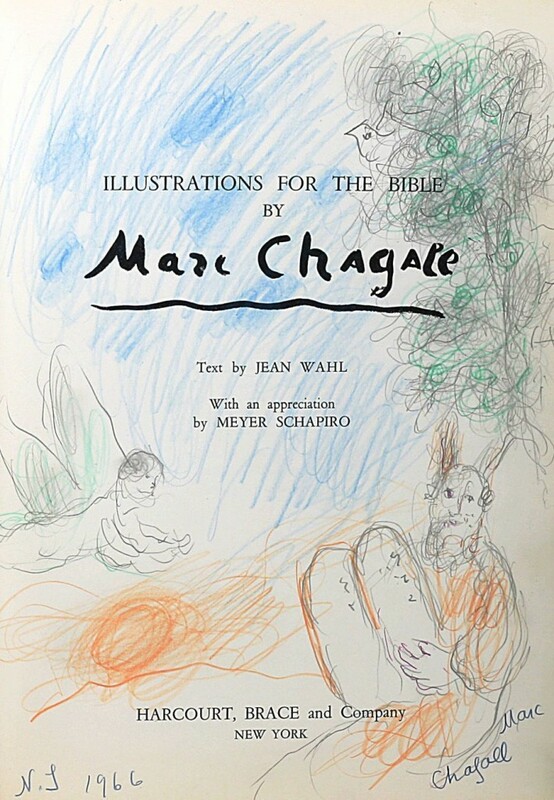 A first American edition copy of Illustrations for the Bible by Marc Chagall, inscribed by the artist and featuring an original, full-page color drawing – not a print – of Moses receiving the Ten Commandments on the cover, is for sale at Manhattan Rare Books Company. Visitors to Barnebys can purchase the book at a fixed price ($40,000), with no bidding required, per special arrangement. The title page of the book, which Chagall composed using orange, blue and green crayons, pencil and ink, is a valuable artwork on its own. The Manhattan Book Company has a retail operation inside Gallery 90 at 1050 Second Avenue in New York City; hours by appointment. The firm specializes in rare books in fine condition and only offers books that meet its high standards of quality and importance. Another top pick for sale is a limited edition copy of Richard Avedon: An Autobiography (Random House, 1993), one of only 250 copies signed by the famous photographer and complete with a special engraver’s proof of Marilyn Monroe laid-in ($4,900). Zachys’ upcoming Fine & Rare Wines auction in New York City is fast approaching. The 1,219-lot sale is slated for Friday, May 19th, online and live at Smith & Wollensky, a chophouse located at 797 3rd Avenue in Manhattan, starting at 9 am Eastern time. Highlights will include a case lot of 12 bottles of 1989 Haut-Brion (est. $12,000-$18,000); a magnum of 1976 La Tâche (est. $3,200-$5,000); and eight bottles of 1982 Salon (est. $3,600-$5,500). All three are from Part 2 of the William Young III collection of top wines. The “Keys to the Cellar” component of the sale will feature six bottles of 1993 Bonnes Mares, Georges Roumier (est. $7,500-$12,000); a case lot of 12 bottles of 1996 Vosne-Romanée Cros Parantoux, Jayer (est. $50,000-$80,000); and six bottles of 2005 Musigny, Mugnier (est. $9,500-$15,000). 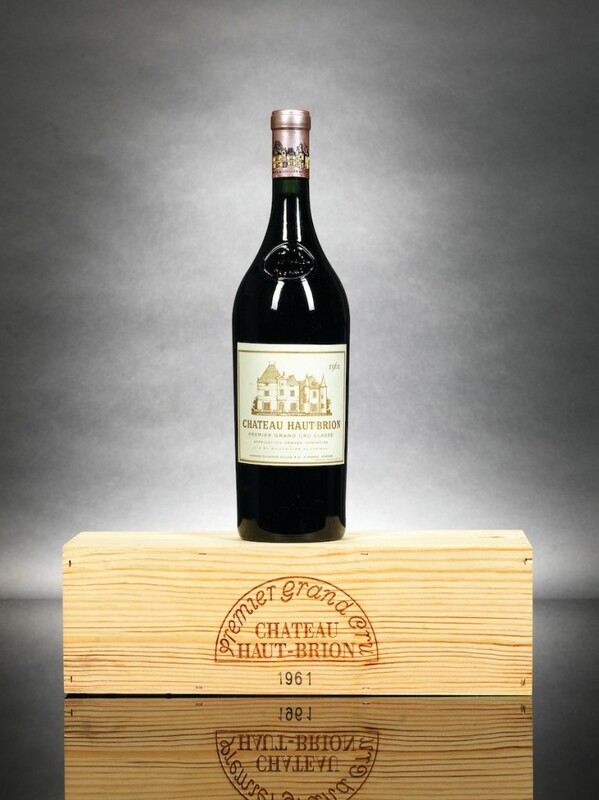 The “Château Direct” lots will include a magnum of 1961 Haut-Brion (shown here, est. $4,000-$6,000); and jeroboams of Haut Brion and La Mission Haut-Brion, both 1989 (est. $8,000-$12,000 and $7,000-$10,000, respectively). 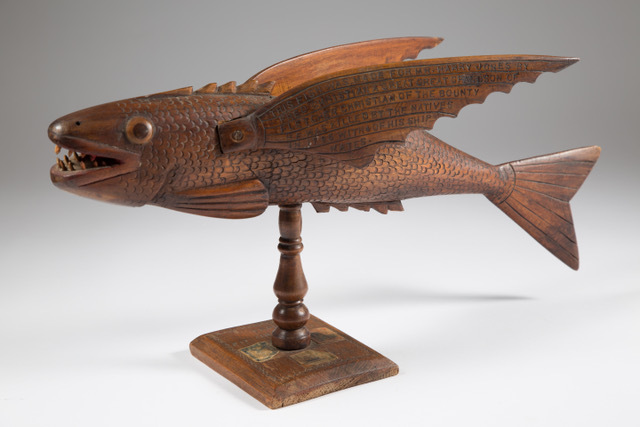 One of the more intriguing items in Lark Mason Associates’ upcoming internet-only auction is the item shown here: a tropical hardwood flying fish, carved between 1920 and 1955 by Frederick Martin Christian, the great-great-grandson of Fletcher Christian (of Mutiny on the Bounty fame). The fish, approximately 20 inches long, contains an inscription explaining the recounting of the number of settlers arriving at Pitcairn Island and the dates, along with postage stamps from early in the reign of Queen Elizabeth II. Though the stamps must have been issued in the 1950s, it is uncertain when the fish was carved, as “Fred” lived from 1883-1971. Lark Mason has assigned it a very reasonable estimate of just $200-$300. It’s part of the Marcy Carsey Collection of American furniture and folk art, to be sold online beginning Thursday, May 18th, and ending on Tuesday, June 6th, on the iGavel Auctions website. The outstanding collection was assembled by the noted gallerist and expert Marcy Carsey and a friend over a period of 25 years. While renovating a house on Long Island, New York, a family came across a watercolor painting that was matted and under glass, and housed in what appeared to be a modest, mid-20th century frame. 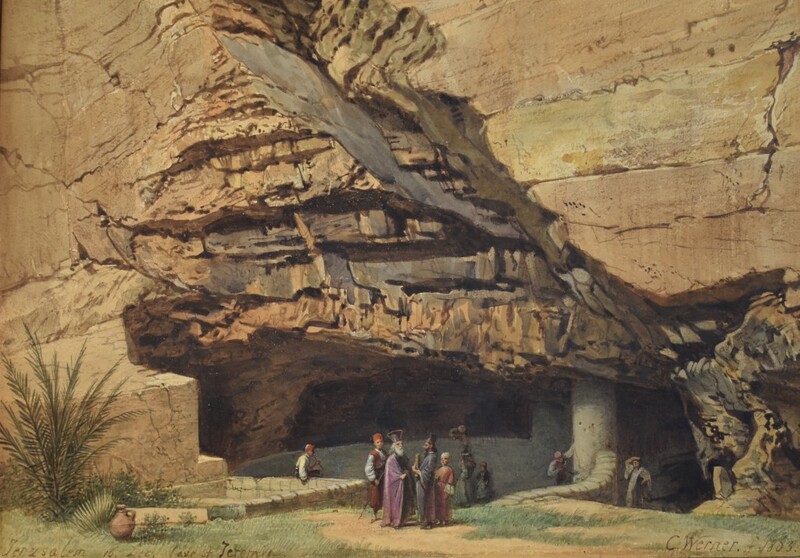 It turned out to be a work by the German painter Carl Werner (1808-1894), titled Grotto of Jeremiah near Jerusalem. The 9 inch by 13 inch painting, signed and dated (1863), is an expected star lot at the inaugural sale of Auction New England on Saturday, May 20th, online and at the firm’s gallery in Manchester, New Hampshire. The painting has been assigned a pre-sale estimate of $4,000-$8,000. “The sale overall is relatively compact,” said Auction New England’s Jack O’Brien. “We worked on getting fresh items that for the most part haven’t been on the market for decades and in some cases for more than a century.” Other featured lots will include a mahogany kneehole desk attributed to Benjamin Frothingham (Am., 1734-1809), a George Washington bookplate and a stoneware lion presentation jug with serpent handle, 8 inches in height. Some auction houses will conduct a two-session sale in one day, and on rare occasion might fit in a third, but four sessions in one day? That’s correct, and John Moran Auctioneers enjoyed such success with its three-session genre-specific auction on April 25th, it’s upping the ante to four sessions on Tuesday, May 23rd, online and at the firm’s gallery in Monrovia, Calif. Session 1, at 10 am Pacific time, will kick things off with a Fine Jewelry Auction, featuring 137 lots of fine jewelry from the Victorian period to the contemporary. Session 2, at 12 o’clock noon, will be a Jewelry Auction, comprising jewelry lots across all design schools and price points. Session 3, at 3:39 pm, will be a Decorative Art Auction, with around 200 lots of art glass, silver, bronzes and other items, from the 18th century to modern times. And finally, at 6:30 pm, a Fined Art Auction will be held, featuring a wide array of works by American, European, Asian and Latin American artists. 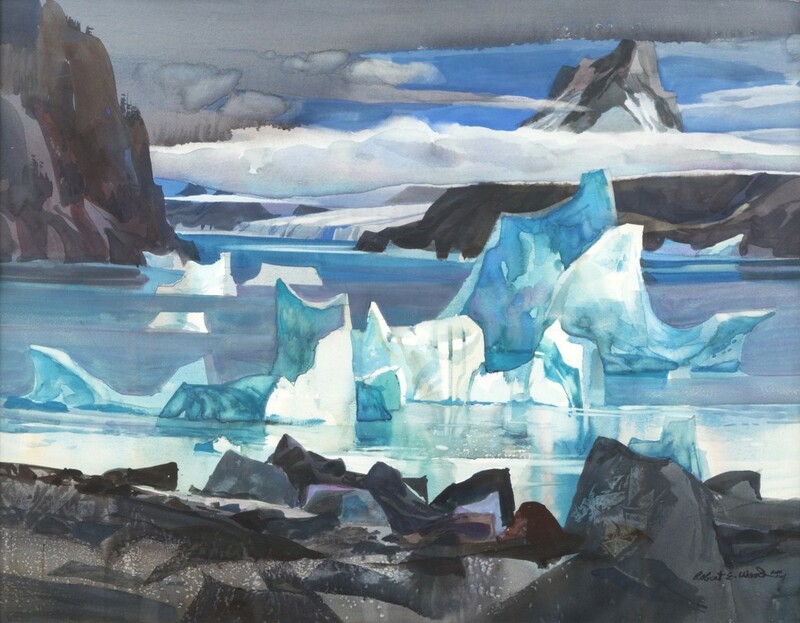 An example is this watercolor work by Robert Earle Wood (1926-1999), titled Portage Glacier III.